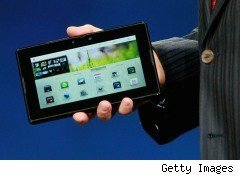 Tablet and netbook computer shipments are expected to skyrocket next year, by a whopping 41%, according to a report released Thursday by research firm DisplaySearch. And that increase is expected to far outstrip a respectable showing by other mobile computers. According to the report, nearly half of that year-over-year tablet and netbook growth is expected to come from Apple's (AAPL) iPad, which sold over 3 million units in roughly three months after its April debut. Tablet and netbook shipments are expected to reach 69.1 million units next year, up from an anticipated 49.2 million this year. "The end of 2007 witnessed the launch of mini-notes [netbook computers]. The first quarter of 2010 signaled the birth of the tablet PC, and possibly by extension, the beginning of the end of the mini-note market, especially in developed regions," John F. Jacobs, director of DisplaySearch's notebook market research, said in a statement. The success of tablets will ride on the availability of "a la carte" software applications and ease in viewing content, the report notes. Contrast that with desktops and various forms of laptops, which primarily are designed to create content, like documents, spreadsheets, and artwork. "Although Apple now holds the vast majority of tablet PC market share, the plethora of other brands that have, or will soon be launching, their own tablets are sure to capitalize on what at this point appears to be widespread consumer demand for very thin and very light devices with exceptional battery life and a primary focus on portability and content consumption," Jacobs said. Investors looking for a hardware play may want to keep that in mind: Thin + Light + Long Battery life + Nice Viewing Screen = Consumers' $.